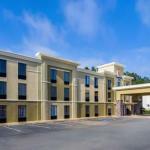 Free hot breakfast complimentary Wi-Fi and a perch that's convenient to I-75 make La Quinta Inn Acworth a top area choice among our guests. The three-story La Quinta offers 44 rooms and suites all featuring comfy pillow-top beds 32-inch flat screen TVs and both Wi-Fi and hardwired internet access. Guests make themselves at home with in-room microwaves mini-refrigerators coffeemakers hairdryers iron and ironing boards. A convenience store in the lobby comes in handy for stocking up on snack or forgotten sundries. Road warriors take advantage of the business center while active guests enjoy the fitness room and pool. Furry friends are always welcome. Parking is free. Minutes from historic Acworth and many Civil War battle sites La Quinta is a straight 40-minute shot up I-75 from Atlanta's Hartsfield-Jackson Airport. Outdoor recreation at Lake Acworth is 10 minutes away. Kennesaw Mountain is a 20-minute drive. Dogs up to 50 pounds are allowed for no additional fee; there is a pet policy to sign at check-in. Dogs may only be left alone in the room if they are sure to remain quiet, and they do not need to be crated if they will only be left alone in the room for a short time.